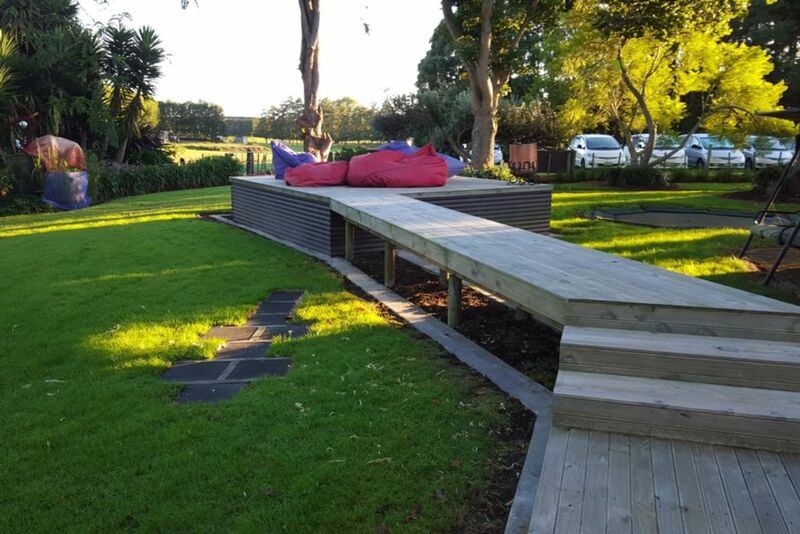 A fabulous home and property setting in the central Bay Of Plenty area, Paengaroa, Te Puke. There is plenty of room for your group to relax, dress and prepare for that wedding/function/reunion. Our local is the well known Funky Lizard just 5 mins up the road. Where they have great music, food and beverages, band on Sunday's are a must! Eat your breakfast and be on the Te Puke Golf Course by 8am - WOW this is just 1 minute away. Visit the Comvita Centre, see the internationally reknowned BEE story and stock up on their awesome cremes and cures. An excellent location close to so many attractions. Within 15 mins drive we have beaches galore - Maketu, Pukehina and Papamoa Beach. We are just 20 mins to the Tauranga Airport, 30 mins to Rotorua airport. Airport collections can be easily arranged. We can also organise catering, hair and makeup, hire cars/vans or buses. In Mount Maunganui you will experience the famous main beach, awesome cafes and night life, plenty of shopping options, the Mount Hot Pools, Baywave and the many activities at Baypark (from speedway to jetsprints, concerts, shows, and netball). Just across the bridge you will be in Tauranga, with many more shopping options, beautiful parks and cafes. Head South out the gate and you will be in Rotorua, where there is an abundance of activities. from the beautiful Blue and Green Lakes, bike riding thru the Redwoods, seeing the wonderful boiling mud pools, soaking in the Polynesian Pools, visiting Fairy Springs or taking a Zorb ride - its just 30 mins away. Simply turn East out the gate and in 30 mins you will arrive in Whakatane , amazing strawberries, blueberries and other fruit stops along a very pleasant drive. Hop over the hill to Ohope and you will arrive to see another one of New Zealand's finest beaches. Lovely day trips for all with interesting sights, tastes and smells. We look forward to hosting you in this awesome corner of the world!! PLEASE NOTE THIS IS NOT A PARTY HOUSE. FAMILY AND GROUP GETAWAYS ONLY. Smoking allowed outside only. Butts in tins provded. Family of 17 throughly enjoyed our lovely stay here. Great base to explore the BOP and at the same time have a rural like experience. Homely property with so much space inside and out. Spacious bathrooms, kitchen and room for the kiddies to play outside. Thank you for sharing your home with us, greatly appreciated! So pleased you and your family & friends enjoyed your stay at the Winter House. Thank you for looking after our property and we are happy that there was plenty of space inside and out for you & your family to relax and enjoy. We would happily welcome you back again in the future. The property was perfect for our large group (8 adults/9 kids). The property was perfect for our large group (8 adults/9 kids). There was space for everyone. The property had everything we needed. The property had everything we needed. Lots of space. Our group of 33 had lots of room to maneuver. Just a good place to stay for large groups. I have nothing but great things to say about Philip, Paula and their WinterHouse! I have nothing but great things to say about Philip, Paula and their WinterHouse! Our group (15 high school aged students and 3 adults) were warmly welcomed and incredibly comfortable throughout our stay. The property is beautiful, the house cozy and the hosts hospitable and helpful. The backyard was a particular hit with our students: trampoline, lounge areas, swing, orchard, volleyball court etc.... Would return in a heart beat. We had a group of 16 guys stay here for the weekend - it was the perfect spot for us! A lovely property! Great location, private a quick drive to Tauranga town. A lovely property! Great location, private a quick drive to Tauranga town. Spacious, perfect for a large group.